With temperatures rising in Middle Tennessee, doctors at Monroe Carell Jr. Children’s Hospital at Vanderbilt stress the danger of leaving children unattended in vehicles. Last year, there were at least 43 deaths of children who were left in hot vehicles in the United States. 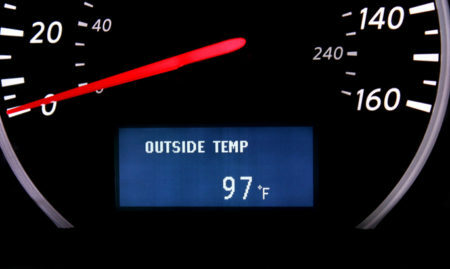 In 2018, there have been at least 10 deaths of vehicular heatstroke reported in Alabama, Connecticut and Arizona, according to KidsandCars.org. Approximately 26 Tennessee children have died from suffering heatstroke in cars since 1998, including one in Nashville this year, according to noheatstroke.org. A new study by Safe Kids Worldwide showed that 14 percent of parents say they have left a child alone inside a parked vehicle despite the risk of heatstroke. For parents of children 3 and under, the percentage increases to 23 percent. According to physicians at Children’s Hospital, a child’s body heats up three to five times faster than an adult’s, and when the body’s temperature reaches 104 degrees, the internal organs begin to shut down. Children are placed at extreme risk for severe hyperthermia and heatstroke in just minutes. “In just 10 minutes the temperature inside a car can rise 19 degrees and continue to rise,” says Purnima Unni, Pediatric Trauma Injury Prevention program Manager. Avoid heatstroke-related injury and death by never leaving your child alone in the car, even for a minute. Use cellphone or computer reminders to make sure children have been dropped off at the desired location. Teach your children never to play in vehicles in order to prevent them from accidentally locking themselves inside one. Be sure to lock all doors and windows to vehicles on your property. Community members who see a child left alone in a hot vehicle should immediately take action and call 911. For more information, please visit Children’s Hospital’s website for detailed safety information http://www.childrenshospital.vanderbilt.org/heatsafety.